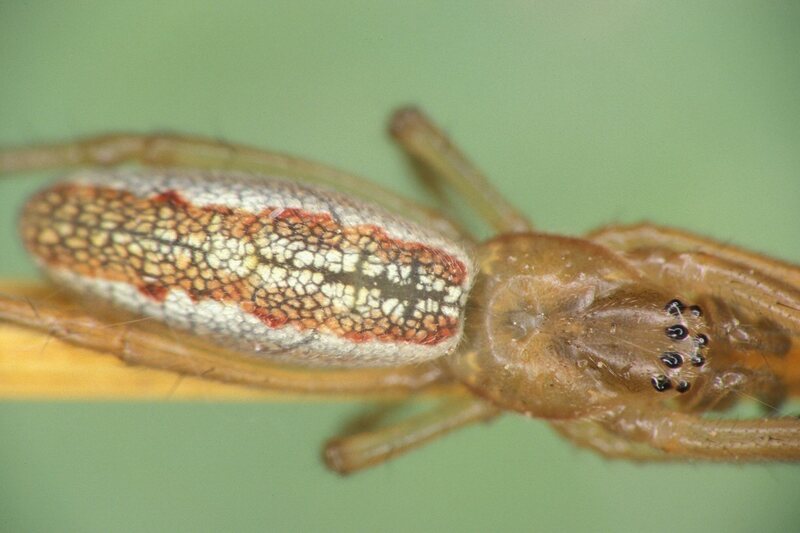 Description: The carapace and large divergent palps are yellowish. The sternum is brown with a distinct light triangle anteriorly. The reticulated markings of the abdomen are quite variable. Usually silvery white with a yellowish or reddish midline band which sometimes is divided longitudinally. The ventral side of the abdomen is blackish edged by white bands. 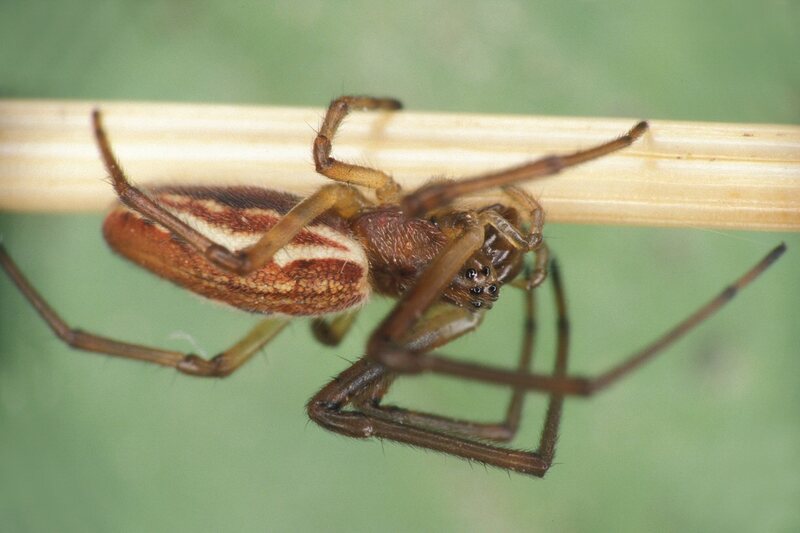 Biology: The spider spins an Size: Female 6.5-11 mm; male 5-9 mm. 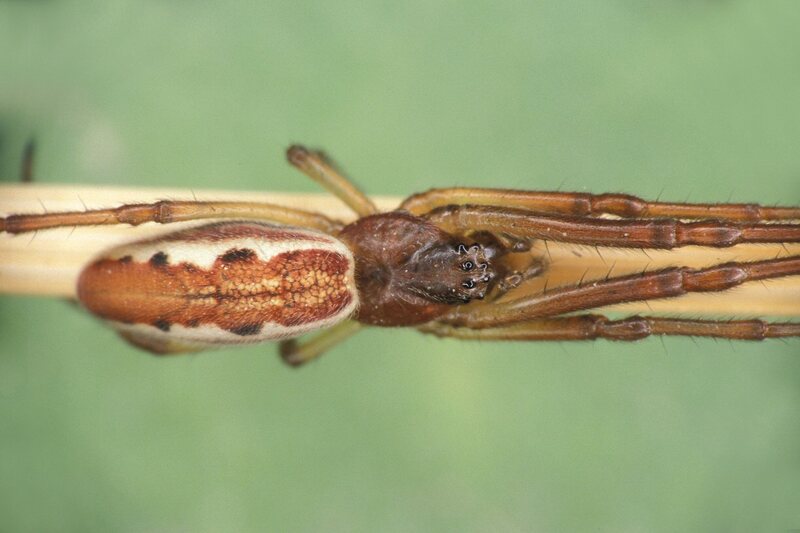 Genus: Tetragnatha Latreille, 1804. 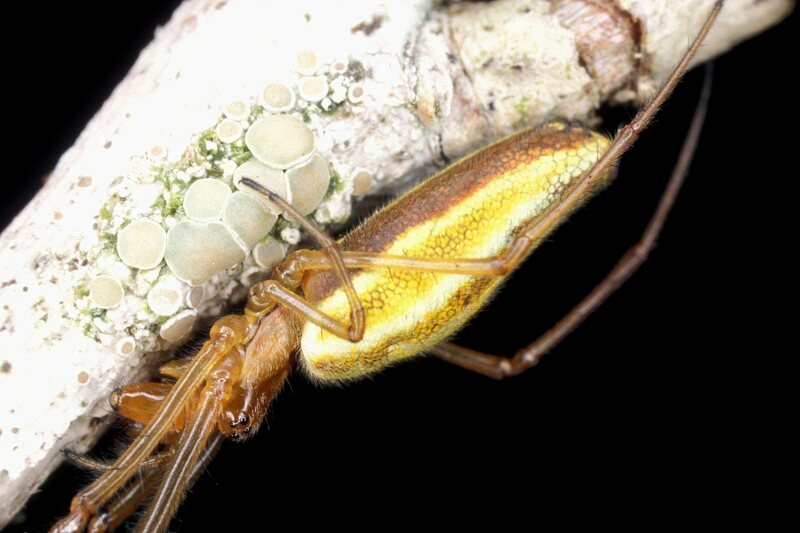 (Longjawed orb weavers, stretch spiders). Characters of genus: The abdomen is elongate and slender usually two or three times as long as wide. The lateral eyes of each row are not contiguous. 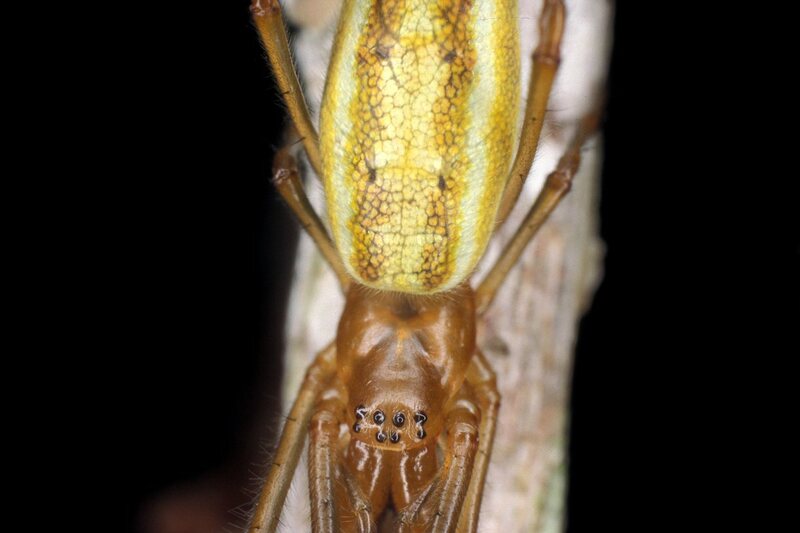 The chelicerae are long and divergent and the fang furrows are provided with long rows of large teeth. The legs are very long and provided with spines. Family: Tetragnathidae Menge, 1866 (Long-jawed Orb Weavers). Characters of family: The tetragnathids belong to the group of ecribellate spider families having 8 eyes and 3 tarsal claws. Many members of the family are usually elongated spiders characterized by the often very long legs and chelicerae (subfamilies Tetragnathinae and Leucauginae). 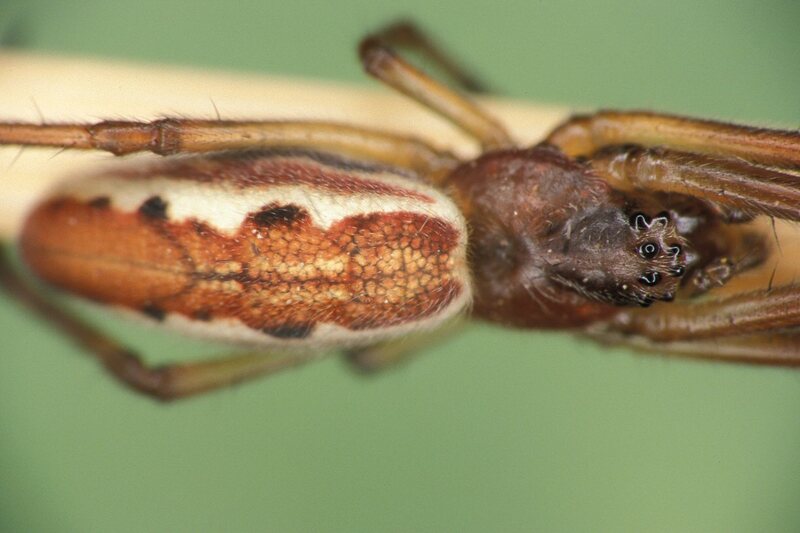 However there are some genera with oval abdomens or normal sized chelicerae (subfamily Metinae). Males are usually smaller and slimmer than females who often have the base of the abdomen swollen. 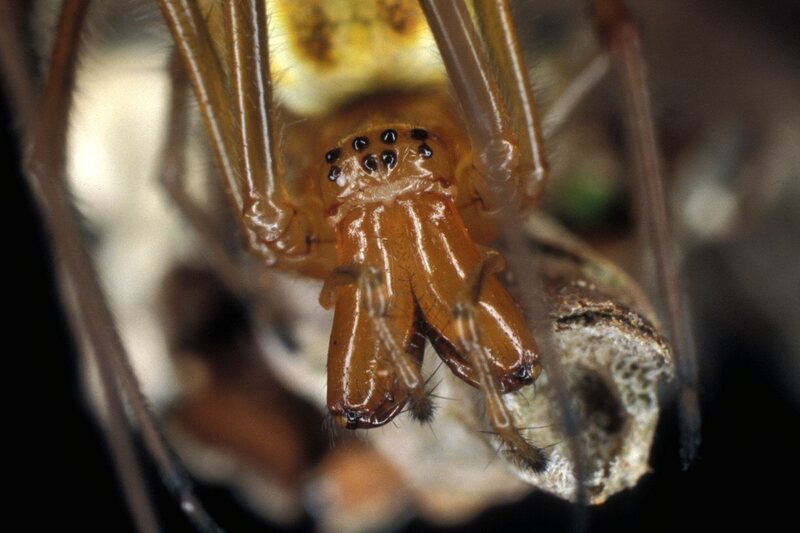 Males often have relatively longer chelicerae than females and sometimes they are even longer than the carapace. The male chelicerae are also often furnished with spurs on their chelicerae, which are used to lock the female chelicerae during mating. The female palp is provided with a well-developed, toothed claw. The eyes are not unlike those of the araneids. They are subequal and arranged in 2 rows of 4 usually equidistant or with the medial eyes closer to each other than to the lateral eyes. The lateral eyes are either spaced apart or contiguous, sometimes situated on a tubercle. The primary eyes are always black. The secondary eyes of most genera are provided with a light-reflecting layer (tapetum) aiding nocturnal vision. 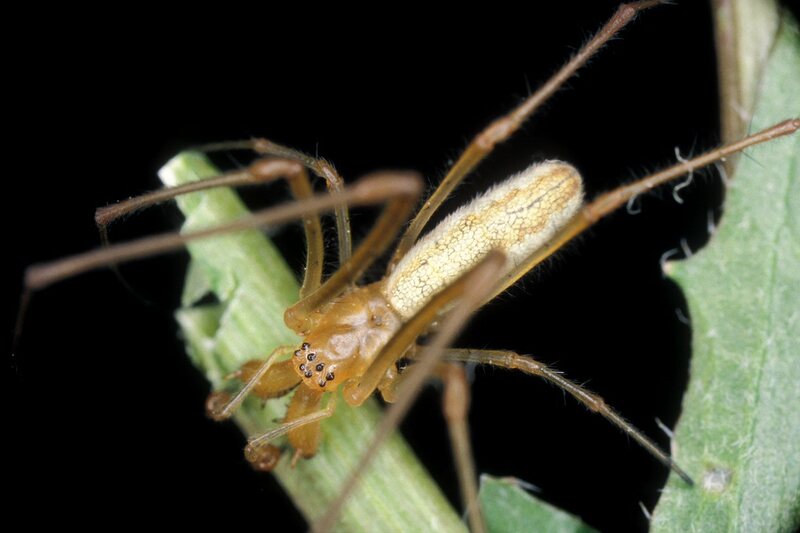 However, tapetum is missing in a few genera such as Tetragnatha having all eyes black. The carapace is elongate and with short, shallow fovea (indistinct in Tetragnatha). The sternum is longer than wide and pointed at rear, sometimes protruding in between coxae IV. Narrow, horizontal sclerites are sometimes present between coxae and carapace. Endites are parallel and may either converge or dilate in front of the rebordered labium. The legs are long and slender and mostly with spines but in some genera there are none (for example Pachygnathy). The trichobothria are often branched. They are sometimes arranged in rows. The shape of the abdomen is variable sometimes round or oval but mostly elongate. Colours vary, quite often with bright white, green, red and yellow colours often with coppery or silvery blotches. Tetragnathids are entelegyne or secondary haplogyne (without epigyne). Sometimes the genital plate is not sclerotized (subfamily Tetragnathinae) and thus adult females may be difficult to separate from subadults and juveniles since there is no epigyne - just a hairy, tongue-shaped plate projecting posteriorly from the epigastric fold. The male palp is simple and often very similar within genera.